When the time comes to water your lawn, it's important to have the proper lawn sprinkler. There are six general types: stationary, rotary, oscillating, pulsating, traveling, and in-ground. The size and layout of your yard, the soil type, and your price range will help determine which lawn sprinkler you should purchase. Stationary lawn sprinklers work well for small areas. They come in a variety of designs. Most stationary types spray water through a pattern of holes in the top. The area of lawn they cover depends on the size, shape, and pattern of the holes and on your water pressure. Stationary sprinklers work with low water pressure, but they won't throw water very far. They are usually inexpensive. Rotary, or revolving, sprinklers spray water from the tips of two or three spinning arms. They throw water down quickly, so would be a poor choice for sandy or sloped areas. Because rotary types have a low throw radius, they work best on smaller lawns and are great for kids to run through on hot summer days. Oscillating sprinklers are among the most common. They spray out a fan-shaped curtain of water. A metal arm oscillates back and forth to cover a rectangular area. The area of distribution can be adjusted on most models. Oscillating types are ideal for watering large areas, and the gentle spray is perfect for newly seeded areas and clay soils that absorb water slowly. Prices vary widely. Look for one that is adjustable and features durable, corrosion-free construction. Lower priced models may distribute water less uniformly. 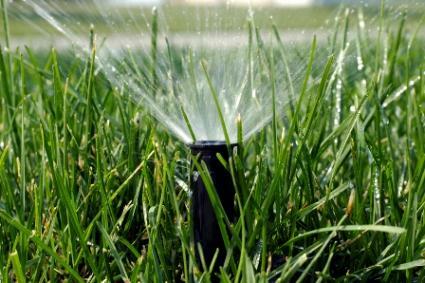 Pulsating, or impulse, sprinklers are among the most efficient for large lawns. They have a single water jet that sits close to the ground. They are durable and distribute water evenly over large areas in circular or semi-circular patterns. The spray is strong and close to the ground, making it wind-resistant. Top-of-the-line models are versatile, allowing you to control the height of the stream, select the spray pattern and coverage area, and adjust the spray from full jet to a fine mist for newly seeded lawns. Traveling, or self-propelled, sprinklers have wheels and follow a garden hose or cord laid out by the user. Two rotating arms spray water in a circular pattern as the sprinkler follows its guide. The arms can be adjusted to vary the diameter of the spray circle. Traveling types can be used to water large, irregular lawns over several hours. They are generally expensive and well made. If you choose a traveling version, make sure it has an automatic shut off valve. In-ground sprinklers or lawn irrigation systems are best suited for large lawns or in regions where grass doesn't grow well without supplemental water. They are expensive to purchase and install. But once a lawn irrigation system is installed, you'll never have to drag a hose around or worry about watering while you're away. Make sure they are installed in a pattern that ensures complete and uniform coverage. Those looking to spend more quality time with their lawns may enjoy using a hand-held sprinkler. Hand-held heads or wands attach to your hose. Watering by hand allows you to target small, newly planted areas with a gentle shower spray. Fertilizing sprinklers are now available. Fill an attached bottle with water soluble fertilizer and automatically fertilize your lawn while watering. Electronic and mechanical timers are available to simplify the watering process. Timers attach to your faucet, hose or sprinkler and can be set to automatically turn the water on and off.